Meeting the third Sunday of the month at 2pm, The Davis Arts Center Poetry Series typically features two readers. Admission is free but donations are always appreciated and all proceeds benefit Davis Arts Center! The Series is hosted by James Lee Jobe. 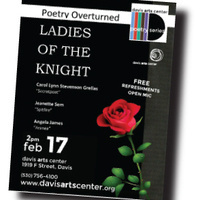 The February reading titled Poetry Overturned – Ladies of the Knight will feature Jeanette Sem (Spitfire), Carol Lynn Stevenson Grellas (Secretpoet) and Angela James (Aranea). The reading will also feature an open mic. Jeanette Sem is a spoken word poet and social activist who started writing three years ago and has never looked back. Since then, she has taken her fiery brand of spoken word to the California Democratic Convention, competed with the Sac Unified Slam team in Chicago and won several slam contests. Her poetry can be heard on the background tracks of Truth Ali’s album, Resurrection: Season 1. Jeanette’s poems highlight awareness of social justice issues, locally and nationally. Carol Lynn Stevenson Grellas is the author of six full-length collections of poetry and numerous chapbooks. Her 2012 chapbook, Before I Go to Sleep, won the Red Ochre Chapbook contest. In 2018, she won second place in the Jack Keourac Poetry competition. Her work has appeared in The Yale Journal for Humanities in Medicine, Poets and Artists, Literature and the Arts, and War. Carol Lynn is the editor of the Orchards Poetry Journal and a member of Saratoga Authors Wall of Fame. In addition, she is a board member of the Sacramento Poetry Center. According to family lore, she is a descendant of Robert Louis Stevenson. Angela James is a poet and storyteller steeped in the oral tradition of her family in the Caribbean. Her eclectic mix of poetry, stories, music and motion appeal to a wide range of audiences. Angela’s work has been published in the literary magazine, Sussuruss and in three collections – Personally, Random Pieces and Words. The CD Echo in the Bone features several of her poetry pieces as well her singing. Angela is a certified multi-disciplined teaching artist and has received grants to promote poetry and storytelling in schools.